Food Dehydrating Made Easy on Udemy! 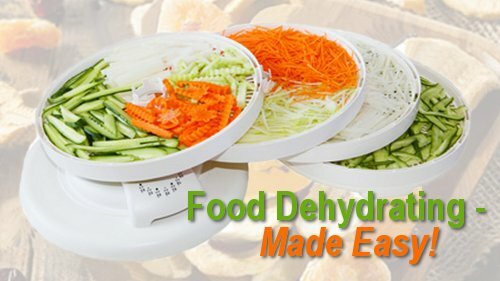 Learn Faster: Food Dehydrating Made Easy on Udemy, the best video-learning platform around! Do you Love to Learn Online? Are You an Audio/Visual Learner? It's a well-known fact that people like to watch videos. Retention is higher when you combine video with the written word. Books can feel flat, literally — but appeal to many people, as Amazon well knows. So I've combined the two: great videos and the written word — and now you have the best of both worlds! Enjoy learning at your own speed, on your own time — with guaranteed LIFETIME access! 3 hours of content; 15 sections; 65+ lectures; 9 quizzes! In the course, I teach you how to safely dehydrate fruits, vegetables, and meat for long-term food storage. Discover the differences between two-styles of dehydrators: the Nesco™ and Excalibur™ and see what supplies you need to have on hand for vacuum-sealing such as a FoodSaver™ vacuum-sealer and bags, plus oxygen absorbers. For long-term food storage, you'll discover the use of Mylar bags, plastic bins, and buckets with air-tight lids that actually unscrew easily! Storing Food Safely for Short- or Long-Term Storage — decide what your needs are — Long term? Short term? Bit of Both? 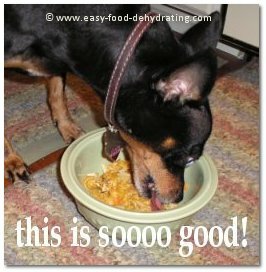 Re-Hydrating Dehydrated Food — which water is the best to use and other tasty ideas! Make your Own Pet Food: Chicken Chow – homemade! See our video (with our talking dog!) We'll show you how to make this delicious, nutritious dog food for your best buddy! I've just reached the ripe old age of 75 (human years!) and every day I still look forward to my Chicken Chow Dog Food. So jump right on in – You won't be disappointed. I love courses like this that go really in-depth on a focused area. Susan is obviously very experienced with using a food dehydrator and I enjoy watching how she shares all the tricks she's learned over the years. Tips on everything from the use of oxygen bags to how to rehydrate foods to specific temperature settings for different fruits, vegetables and meats. The real benefit for me is that I'm currently a casual food dehydrator (already own a Nesco) and now that I'm more confident in my preparation techniques I can move towards making dehydrated foods a larger portion of my food supply. A very comprehensive course on food dehydrating! This course really covers it all when it comes to learning food dehydrating! I like how it's laid out and the videos are very informative and easy to understand. Would highly recommend for anyone who wants to make good use of food dehydrating techniques! If not totally delighted, Udemy promises to return every cent with their 30-Day money-back guarantee!